I realize that we've not shown a lot of after photos. 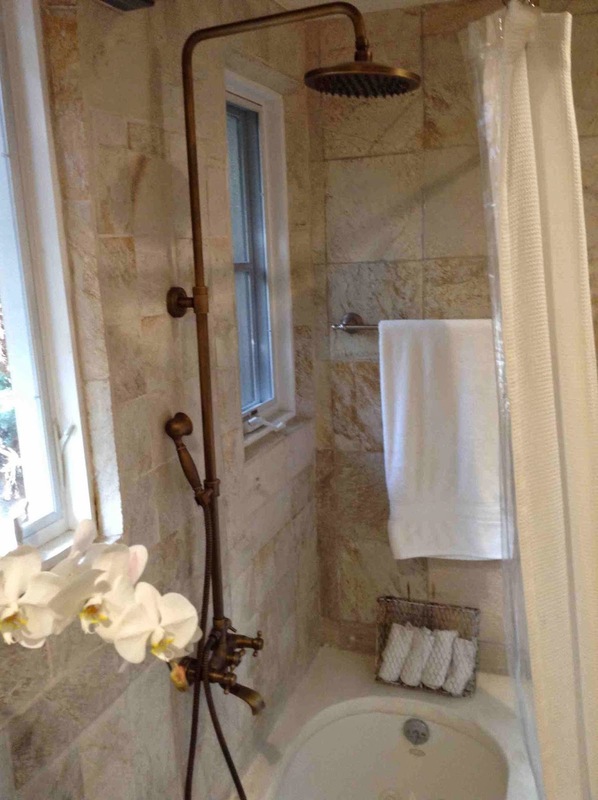 Unfortunately, we don't have a before photo of the master bathroom shown here. The major changes to this space were really the floor: We added a concrete floor to replace the stone that we just couldn't seem to keep clean. And we also re-sloped it to drain properly. There is actually a drain in the center of the floor for mopping. I should add that the new ceiling, which is cedar plank, was added when we put in the loft above. 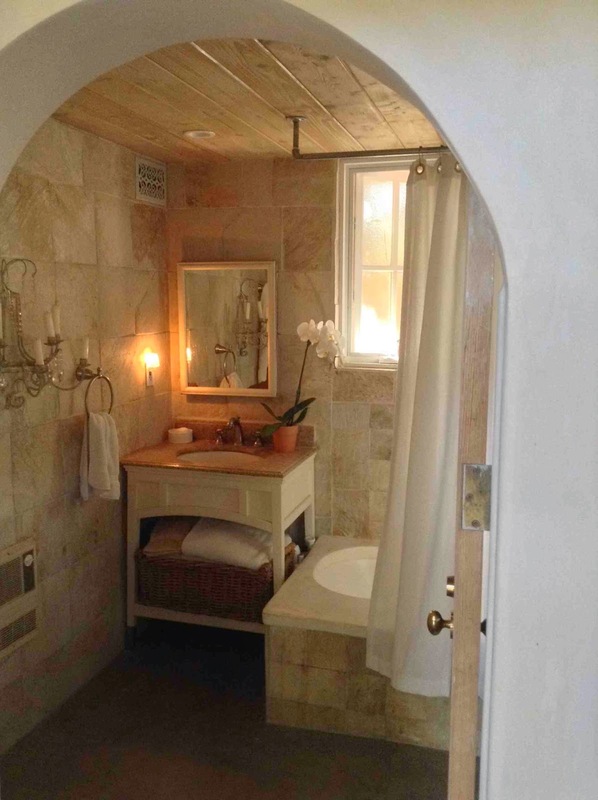 The ceiling is now lower than the old bathroom, but it adds an architectural detail that gives this room more interest. We replaced the original wood windows with these new casements. And, we also installed a new shower/tub fixture. We decided to mix our metals here: Brass, antique brass, brushed nickel and chrome. I thought you had to keep one metal throughout design-wise, but this blending experiment proved not so terrible. You'll notice the door knob to the bathroom (shown in top photo) is brass and yet, on the monochromatic palette of white, cream and golden tones, the different metals somehow work together. What do you think? 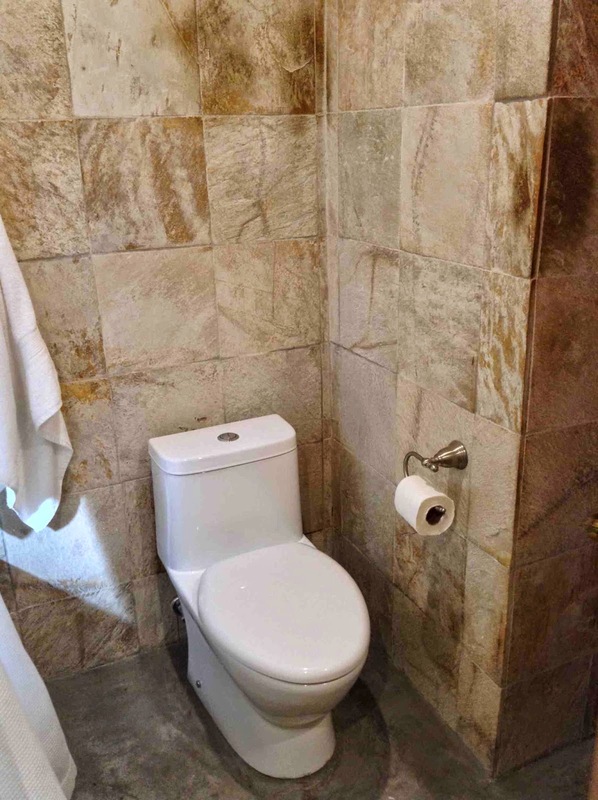 I wanted to point out that this toilet is European style. It's water efficient, but its best feature is that the base of it is smooth unlike all those models at Home Depot with the porcelain "piping" on the side. This is so much easier to clean.